Vittorio de Sica's seminal neorealist drama is one of the great Italian films, habitually included on lists of the greatest works of international cinema. It is the very simple story of Antonio Ricci (Lamberto Maggiorani), an unemployed man in postwar Rome who obtains a job that requires him to have a bicycle, which he obtains with some difficulty, only to have it stolen his first day at work -- as he is affixing a movie poster to a public wall. Accompanied by his spirited, preternaturally mature son Bruno (the extraordinary Enzo Staiola), Antonio takes to the streets in the hope of recovering it, only to be tortured by shame and hunger to the point of thievery himself. I admired this film tremendously but, for me, it isn't commensurate with the more lacerating humanistic quality of De Sica's UMBERTO D., which followed a year or two later. To look at it closely and honesty, the Ricci family is depicted from the outset as a little too good to be true; these scenes prepare you a little too consciously for the other shoe to drop. Likewise, Maggiorani isn't quite so expressive an actor without Staiola there to externalize the anxieties of his conscience, while the film's real heart exudes from Lianella Carell, who plays the wife and mother of the family, given the appropriately Madonna-like name of Maria. When all is said and done, the film's entire journey doesn't quite top the sucker punch power of an early shot which follows the attendant of a pawn shop, where Maria has taken her best linen to help with the purchase of the bicycle ("We can sleep without sheets"), as he climbs a towering system of shelves where he tosses the rolled material atop dozens of others of its type. 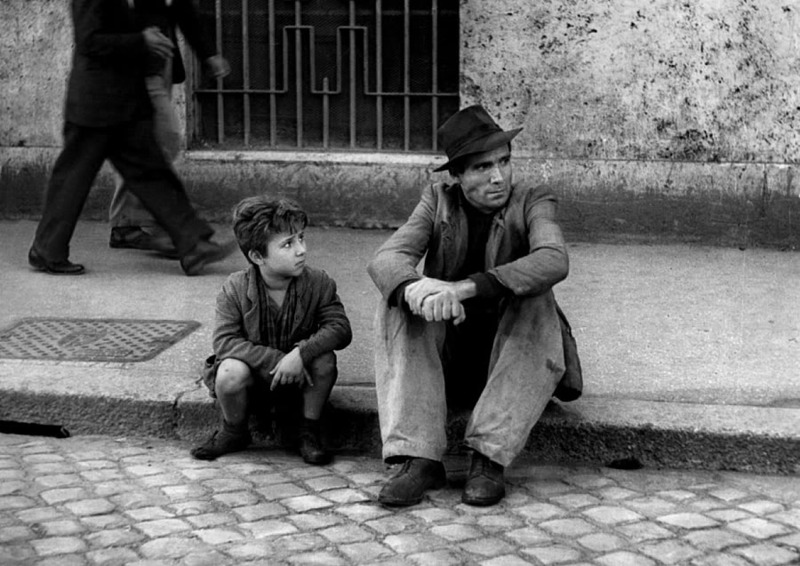 While watching BICYCLE THIEVES for the first time, I had the feeling I've derived from other De Sica films -- that, in the great banquet of cinema, the best of his films embodies its bread. They are that basic, that fundamental and that honest. Viewed via Arrow Films Blu-ray/DVD combo import set, though it is also available in a similar two-disc set from Criterion domestically. Both sets share a healthy amount of supplementary contents, including a documentary about screenwriter Cesare Zavattini.